Dilmah Founder Merrill J. Fernando received the Business for Peace Award on the 6th of May 2015, incidentally also his birthday, as one of the five 2015 Oslo Business for Peace Honourees, by the Award Committee of Nobel Laureates in Peace and Economics. 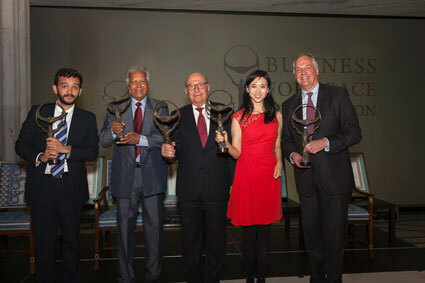 The Business for Peace Foundation annually names honourees for the Oslo Business for Peace Award in recognition of business persons who, "through their own actions and commitments truly are business worthy, promoting socially responsible and ethical business practices in an outstanding way, and standing out as examples to the world." Accepting the award - a bronze figure entitled 'The Just Man' - on his birthday, Merrill J. Fernando spoke of his parents' influence on the values that govern his business today, and paid tribute to the quality of Ceylon Tea as the foundation of his success with Dilmah Tea. "Today this business is a global, much respected brand of Ceylon tea. Dilmah has re-established the image of Ceylon tea cross the world and is much known as ethical tea. That success is not my own alone. I decided to share what I have with the poor. And it gives me immense satisfaction" stated Merrill J. Fernando at an event held at the Peliyagoda factory premises with regards to receiving the Oslo award. The Business for Peace Award was initiated by Per L. Saxegaard, a banker whose commitment to recognising and encouraging sustainability in business led to the establishment of the award with considerable global support. Writing in the Huffington Post, Per Saxegaard declares, "We want the world to know: there are better ways of doing business -- effective ways -- that lead to stability and peace. Just look to the 2015 Oslo Business for Peace honourees. We need more like them now." The man known as the Teamaker - Dilmah Founder Merrill J. Fernando - was honoured in the United Kingdom with the FIRST Award for Responsible Capitalism 2016, on November 30 at the Royal Automobile Club, London. The Award recognises business ethics, emphasizing his unique philosophy of making business a matter of human service. At the presentation of the Award by Rt. Hon. Philip Hammond MP., Chancellor of the Exchequer, at the Royal Automobile Club in London, Merrill J. Fernando explained, "When I look back on my life, for many years, I believed I was very lucky. Ten years ago, I realised it was divine guidance. I owe everything to Almighty God. The Holy Bible states that what we spend on charity is lending to God and God repays us in abundance. I am a beneficiary of that abundance, which I share generously." In selecting the recipient of the Award, the judges were looking for a business leader who has demonstrated social responsibility as an integral part of commercial success; someone who has run a company in a clearly responsible way. 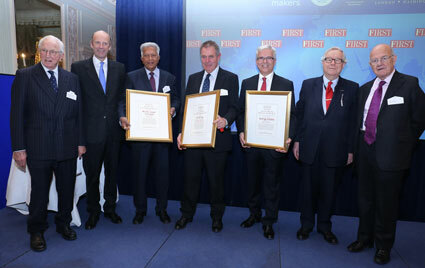 The Dilmah Founder received the main Award whilst two special awards were also presented. Commended recipients were judged on their concern for the environment and the local communities in which their companies and organisations are active.